I'm trying to create a custom table view cell from a nib. I'm referring to this article here. I'm facing two issues. I created a .xib file with a UITableViewCell object dragged on to it. 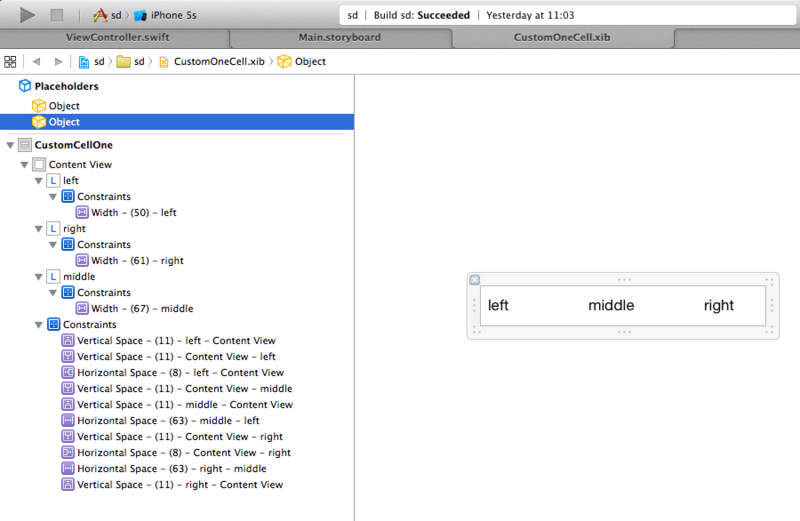 I created a subclass of UITableViewCell and set it as the cell's class and Cell as the reusable identifier. @IBOutlet weak var middleLabel: UILabel! @IBOutlet weak var leftLabel: UILabel! @IBOutlet weak var rightLabel: UILabel! This code complies with no errors but when I run it in the simulator, it looks like this. In the UITableViewController in the storyboard I haven't done anything to the cell. Blank identifier and no subclass. I tried adding the Cell identifier to the prototype cell and ran it again but I get the same result. Another error I faced is, when I tried to implement the following method in the UITableViewController. Anyone have any idea how to resolve these errors? These seemed to work fine in Objective-C.
EDIT: I just noticed if I change the simulator's orientation to landscape and turn it back to portrait, the cells appear! I still couldn't figure out what's going on. I uploaded an Xcode project here demonstrating the problem if you have time for a quick look. The image below shows a set of constraints that work with the provided code without any constraints ambiguity message from Xcode. Here's my approach using Swift 2 and Xcode 7.3. This example will use a single ViewController to load two .xib files -- one for a UITableView and one for the UITableCellView. For this example you can drop a UITableView right into an empty TableNib.xib file. Inside, set the file's owner to your ViewController class and use an outlet to reference the tableView. To create your Custom cell, again, drop a Table View Cell object into an empty TableCellNib.xib file. This time, in the cell .xib file you don't have to specify an "owner" but you do need to specify a Custom Class and an identifier like "TableCellId"
The code shows how you can simply load and display a nib file (the table), and second how to register a nib for cell use. Another method that may work for you (it's how I do it) is registering a class. 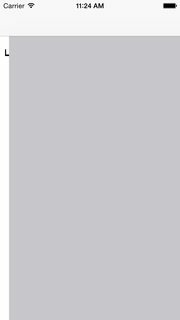 @IBOutlet weak var imgBookLogo: UIImageView! @IBOutlet weak var lblTitle: UILabel! @IBOutlet weak var lblPublisher: UILabel! @IBOutlet weak var tblMainVC: UITableView! let arrNib:Array = Bundle.main.loadNibNamed("simpleTableViewCell",owner: self, options: nil)! Not the answer you're looking for? Browse other questions tagged ios uitableview swift ios8 or ask your own question. Why custom views in stack view are overlapping? How to add multiple UITableView dynamically/programatically in ios using swift? How can I display multiple string values to multiple labels in a custom TableView Cell in swift ios?